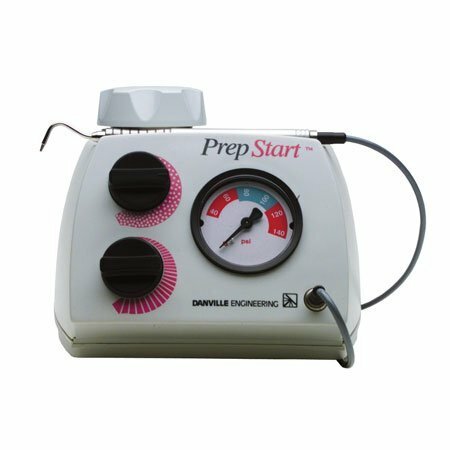 I’ve been using air abrasion technology for over 25 years and couldn’t imagine not having an air abrasion unit in my practice. Air abrasion simply uses air pressure to drive a fine jet of 27 micron aluminium oxide abrasive powder through a nozzle. It is used to remove hard tooth structure, clean the smear layer off dentine and to remove the hyper-mineralised few microns of enamel. It can also be used to clean out any fixed prosthesis prior to bonding or cementation. I also use it to do small class 1, 2, 3 and 5 filling preps without anaesthesia and to remove old base materials below old fillings. Other uses include highlighting pulpal floor cracks, opening the cement margin under a provisional Maryland Bridge to ease removal, and producing a chemically clean surface for any bonding or adhesive procedures on any hard dental surfaces. Air abrasion handpieces are far smaller than high- or low-speed handpieces and allow access in more restricted spaces like distals of last teeth in an arch, and caries undermining a crown or bridge. The PrepStart units come in an air/powder version and an air/powder/water version which spreads less dust around the room. It can be messy and suction lines need to be regularly cleaned as the powder can block them.